With the book The Alchemy of Things (interiors shaped by curious minds) by Karen McCartney now officially launched and on sale, Design daily thought it would be appropriate to share some of the images that didn't quite make the cut. The book's photographer Michael Wee and Design daily as stylist (and travel agent) started shooting the book back in early December 2016 and by early 2017 had six amazing Australian interiors in the bag. The author had by this time selected and been given permission to shoot nine amazing houses and apartments across Europe. Through March and April last year Michael and I travelled to The Netherlands, Belgium, France and Italy - after an aborted start in London where our first European shoot, in the apartment of a prominent interior designer, was cancelled the day before we arrived due to an untimely water leak. The front room of the house of Frederic Hooft and his partner Eva Goethals immediately signalled that we were in for a stimulating and rewarding shoot. Belgian Interior designer Frederic Hooft and his partner, graphic designer Eva Goethals, manage to combine the extremely rustic qualities of battered woodwork and roughly stripped paint with the refined nuances of an enviable collection of vintage and contemporary furniture pieces. Vintage Le Corbusier, Jean Prouve, Charlotte Perriand and Pierre Chapo sit comfortably with work by Konstantin Grcic and Maarten Van Severen. While the furniture in the house covers the thirties right through to contemporary pieces, Frederic is utterly obsessed by Achille Castiglione's Parentesi lamp - we were hard pressed not to have one captured in every shot but the mix of old, new, the curated and the haphazard was incredibly exciting to photograph. Karen McCartney had been a magazine editor for more than 20 years before creating her first 'proper' book back in 2007. 50/60/70 Iconic Australian Houses has been an ongoing success story and continues to sell well more than a decade later. 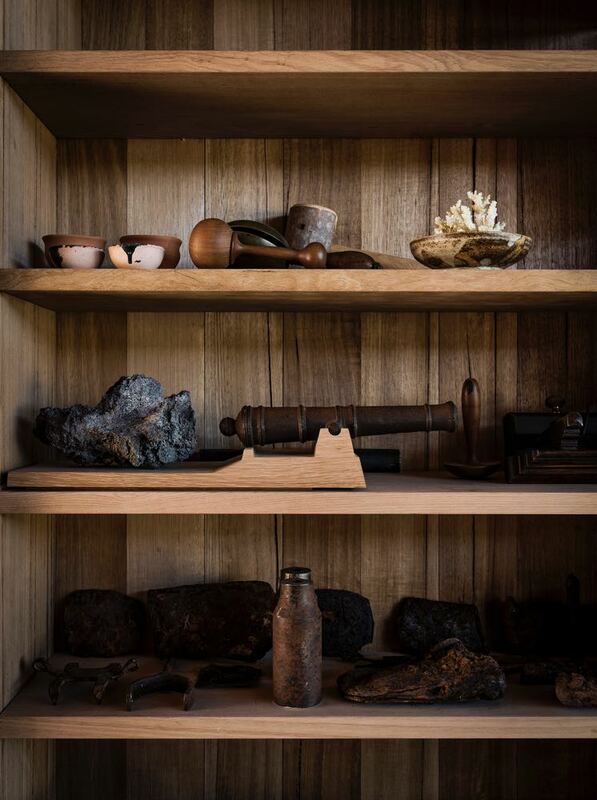 Her previous book to Alchemy of Things, Perfect Imperfect (photographed by Sharyn Cairns and styled by long time associate Glen Proebstel) was an exceptional book that explored the importance of the handmade, age and patina in interiors and objects. Alchemy continues to look in this direction with a particular interest in interiors developed over time and the important role collecting takes in creating interiors with depth and complexity. The monastic quality of Gallerie Valerie Traan in Antwerp is not only due to owner Veerle Wenes' exceptional interior editing skills (although this does play a major part). The building was once a workshop for nuns. Here outdoor furniture by Muller Van Severen completes the composition perfectly. Karen's insistence on one photographer to produce all the images in a book always delivers a visually and emotionally consistent result. Beyond this it is her highly attuned editing skills that ensures that the pages flow effortlessly and that the images and text consistently support each other. In conjunction with art director Evi Oetomo (or Evi O as she is known on instagram) Karen selected and cropped images, oversaw the layout of each and every page and wrote the text. Her books are the complete package with Karen driving everything from start to finish. Some of the chapters would not have been possible had Karen not worked this way. Convincing Veerle Wenes the founder/owner of Valerie Traan Gallery in Antwerp that being in the book was a good idea was no easy task. It was not until Karen had shown Veerle the layout of her chapter that we finally received the final approval. It was a difficult process but absolutely worth the anxiety. Valerie Traan Gallery pays no attention to boundaries in the fields of fine art and design. If its good and it’s interesting it might make the cut. Veerle is a ruthless editor with a very defined view of what works and what does not. While her home is part of the same building as the gallery, it is very much her private space and no amount of begging would convince her to allow us to take a peek upstairs. The shots in the book and those immediately above are of a blurred space - somewhere between the public and the private - where clients can view works, drink tea and admire how Veerle integrates art and objects into everyday life. Given that Karen's role in the creation of The Alchemy of Things is so essential, what is the purpose of a blog post on the photographic out-takes of the project? Like film trims on the cutting room floor, these images provide an additional perspective. That's not to say these images should have ever made it into the final layout, just that they provide an interesting insight into what lies beyond the camera frame or in this case the finished pages of a book. The four images seen above are from architect John Wardle’s country house on Bruny Island in far south Tasmania. His chapter was already twenty pages, so several extremely evocative images were not able to be included in the finished book. While a huge amount of time and effort went into carefully selecting the houses and apartments for the pages of The Alchemy of Things, one of the chapters, the home of Michael Coorengel and Jean-Pierre Calvagrac in Paris was a complete fluke. Through what Karen refers to as an ‘email snafu ‘ we ended up knocking on the door of this apartment in the second arrondissement thinking it was a cleverly concealed contemporary intervention into a classical French apartment block. Instead we discovered a highly theatrical interior with a mix of exceptional contemporary art, intricate plaster mouldings and a hugely eclectic selection of furniture that encompassed 60’s futurist pieces and 17th century antiques - and everything in between. Michael and Jean-Pierre - both interior designers - have a intense appreciation of a broad range of art periods and styles and enjoy the challenge of bringing these together harmoniously. Belgian artist Henk Duijn and fashion and textile designer Hubert Van der Meer had only recently moved to their new house in France when we came to shoot it. The couple had previously run a beautifully curated B&B in Antwerp for many years that we had heard about through Australian vintage dealer Don Cameron. Sight unseen we ventured to their little village vaguely in the vicinity of Toulouse, trusting Don’s good taste and hoping the images he had taken of their past residence would be a indication of what they might have created in France. Thankfully the interior was everything we had hoped for with Henk and Hubert’s unique approach to wall treatments particularly in evidence. Many of the walls in the house are covered with fabric remnants and marbled endpapers from vintage books while the furniture has largely been collected from local auctions and flea markets. A few key pieces were brought with them from Antwerp but the couple were at pains not to recreate their Belgium interior in France. For many years I had drooled over the objects offered by Parisian design destination Galerie kreo. To shoot this apartment was both frightening and exhilarating. The sheer volume of exceptional furniture, lighting and art was quite astounding. Moving objects with this type of rarity and value is a scary process. The owners were unphased by the possibility of accidental damage and left Michael and I to our own devices for the entire day. While the apartment looks like a contemporary art museum it really is the family home - proven when I opened a door to a room to discover Clémence and Didier’s teenage daughter still asleep in bed. Although a little embarrassing it did confirm that the Krzentowski family genuinely live their lives within a total art and design environment. 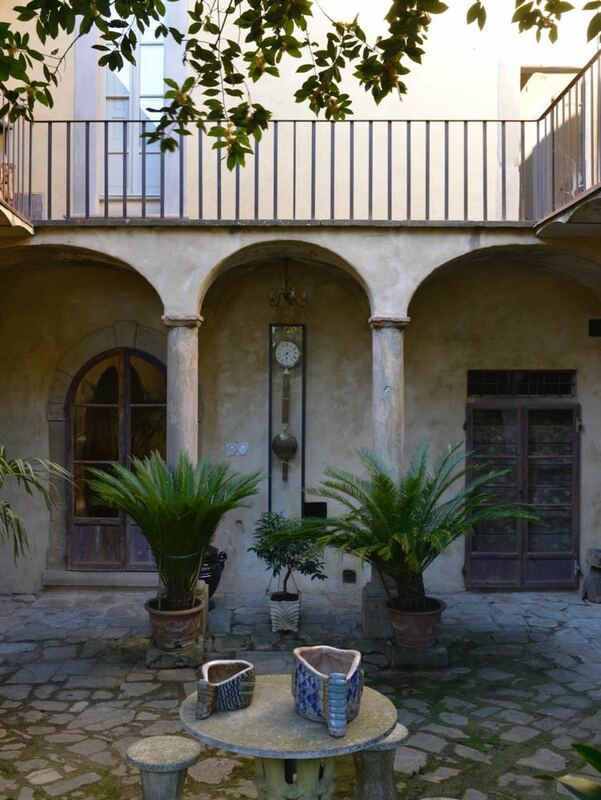 Another house that had my heart pounding from the moment I entered was that of Italian architect Roberto Baciocchi in the Tuscan town of Arrezo. The house incorporates a tower from the 13th century that was once part of the towns original city ramparts. Baciocchi’s architectural intervention is as masterful as it is restrained. 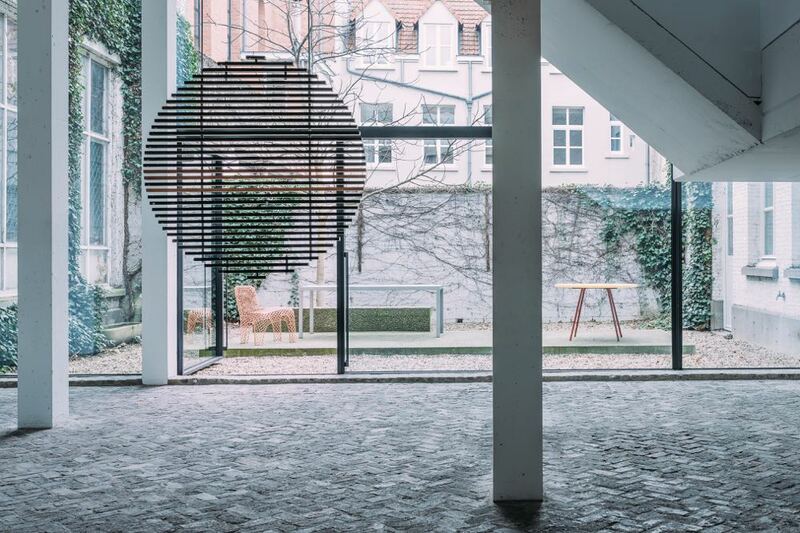 Fine metal framed windows were added around the rooms that face onto the central courtyard bringing light into the dark stone building while the clever use colour and graphic devices divide up the spaces but also often connect them. His collection of furniture, lighting and decorative objects is exceptional. Acquired over many years, his vast collections of antique tableware and glassware are equally inspiring - whole rooms full of these precious objects carefully displayed and kept in perfect order. Michael and I were treated to a magnificent sit down lunch (with wine) while I interviewed Mr Baciocchi with the help of his English speaking son-in-law. His housekeeper even gave us restaurant recommendations for our dinner that evening. With a house this big, full of such an incredible array of objects we continued shooting until we ran out of light. The restaurant recommendation was excellent too! By comparison the house in Canberra of Italian born architect, Enrico Taglietti, is a modest affair. Purchased for he and his wife Francesca when Taglietti received the commission to design the Italian Embassy in Canberra in 1956, the house is filled with deeply personal objects, furniture and lighting prototypes, photographs and the art of his daughter, Tanja. The house has a warmth that reflects Enrico’s enduring love of Canberra. Now in his nineties, Enrico still designs and enjoys discussing the merits and pitfalls of Canberra’s town planning approach across the decades and the state of contemporary architecture. The last group of images (seen above) are from the apartment of Milanese stylist and creative director, Elisa Ossino. Her white space is small but a delightful mix of classic furniture pieces and crafted objects - all very beautifully styled of course! My job on this particular shoot was to slightly reposition a few objects and chat to Elisa about her busy work schedule as she prepared for Salone del Mobile. Ossino is a creative tour de force, controlling the look of numerous influential brands such as Boffi and De Padova while art directing advertising campaigns and designing her own furniture and lighting pieces. The view from the very first house we shot for The Alchemy of Things - the country house of Melbourne vintage dealer Geoffrey Hatty. The early 20th century railway bridge in the distance is the perfect view for an enthusiast of industrial design. The Alchemy of Things (interiors shaped by curious minds) by Karen McCartney is published by Murdoch Books and is now on sale in Australia, priced at $59.95. The book will be on sale in the UK and the US in early October.